1 Cent USA S&H Uncut Simplicity Sewing Pattern 4996. Misses sizes 6 8 10 12. 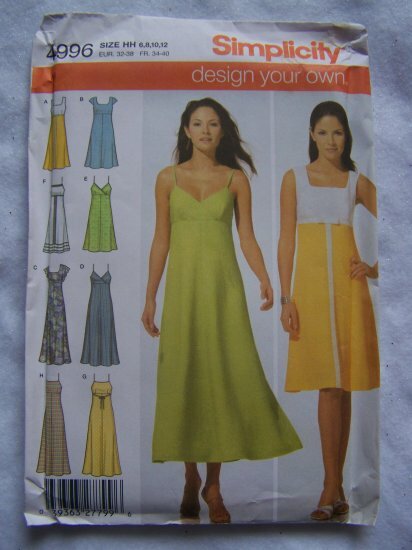 Design your own summer sundress, 6 dresses with neckline variations and two lengths. 100's of new and vintage sewing patterns listed. ** I have this pattern listed separately in sizes 14 16 18 20. Just ask if you can't find it, I'll send you a link for fast purchase! Measurements; Bust 30.5 - 34". Waist 23 - 26.5". Hip 9" below waist 32.5 - 36". **Uncut, with instructions. NOTE side of envelope was unglued and I had to tape it closed. Estate sale find. Many more patterns listed! Fabrics: Laundered cottons, batiks, chambray, damask, pique, poplin, sateen, challis, crepe, laundered silks-rayons, double georgette, satin, shantung, soft lt wt linen and linen blends..
.*Some envelopes are torn, curling or have writing or yellowing from age. S & H to the USA is 1 penny first class.